Founded in 1992, the National Alternative Fuels Training Consortium (NAFTC) is the only nationwide training organization dedicated to promoting, supporting, and expanding the use of alternative fuel and advanced technology vehicles in an effort to improve air quality and decrease U.S. dependence on foreign oil. It is our mission to educate the nation about alternative fuel and advanced technology vehicles through program management, curriculum development, training implementation and outreach and education activities leading to the decrease of U.S. dependence on foreign oil and the improvement of air quality. Headquartered at West Virginia University, the NAFTC consists of National and Associate Training Centers located nationwide from Maine to California. Each center provides Training with Impact through its experienced instructors and real-world shop facilities. Numerous other members from small businesses, government, and industry also support the NAFTC’s mission. The National Alternative Fuels Training Consortium (NAFTC) is a pioneer and national leader in developing, managing, and promoting programs and activities that desire to cure America’s addiction to oil, lead to energy independence, and encourage the greater use of cleaner transportation. The NAFTC is the only nationwide alternative fuel vehicle and advanced technology vehicle training organization in the United States. It is our mission to provide the training infrastructure for implementing widespread use of alternative fuels, alternative fuel vehicles (AFVs), and advanced technology vehicles, in an effort to increase our nation’s energy security and improve our air quality by reducing greenhouse gas emissions from our transportation system. The NAFTC is headquartered at West Virginia University and consists of National Training Centers (NTCs) located nationwide from Maine to California. Each NTC provides Training with Impact through its experienced instructors and real-world shop facilities. Presently, more than 1,600 courses have been conducted by the NAFTC, resulting in more than 30,000 trained technicians in AFVs and advanced technology vehicles. More than 1,500 workshops and education/awareness events have been conducted with more than 600,000 attendees. October 15, 2010 had more than 230,000 people in attendance at 131 sites with more than 98 million reached through media outlets. October 3, 2008, had nearly 200,000 people in attendance at 90 sites with more than 50 million reached through media outlets. October 12, 2006, had nearly 40,000 people in attendance at 60 sites with more than 30 million reached through media outlets. April 2, 2004, was held at 54 sites in 34 states with nearly 25,000 direct attendees and reached more than 24 million people through media coverage. April 11, 2002, was held at 51 sites in 31 states with more than 17,000 people in attendance. The NAFTC twice conducted the opening workshop at the U.S. DOE National Clean Cities Conference. The NAFTC has a state-of-the-art national training lab and headquarters facility at West Virginia University, in Morgantown, West Virginia. More than 1,000 organizations such as Walt Disney World, U.S. Air Force, and NASA have participated in the NAFTC’s training, education, and outreach activities. 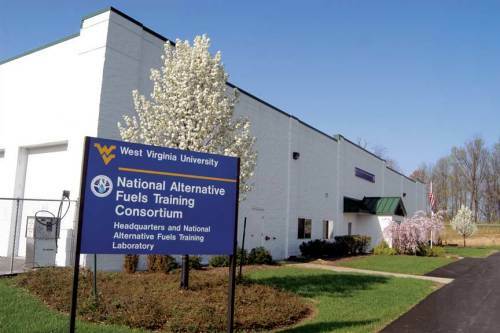 Under contract with the U.S. Environmental Protection Agency, West Virginia University (WVU) started the National Alternative Fuels Training Consortium (NAFTC) in late 1992 to address the urgent need for training and support of alternative fuel vehicle (AFV) technicians in the field. WVU worked closely with the natural gas industry in conceiving the program. A Train-the-Trainers approach was adopted, and courses were developed to teach alternative fuel vehicle technology to trainers who then return to their institutions to conduct training. After receiving their initial training at WVU, these trainers are supported with updated training, technical materials, training aids and online information through the NAFTC’s website. The audience for the program includes vo-tech instructors, four-year college and community college faculty, fleet managers and technicians, instructors, government agency personnel, military support personnel, utility technicians, and anyone involved in alternative fuel vehicle development. In 1995, WVU announced the addition of six technical training centers to the program to enhance dissemination of alternative fuels training materials and public education and awareness programs. Since that time, the program has expanded and also includes affiliate members in a formal training network now known as the National Alternative Fuels Training Consortium (NAFTC). The NAFTC currently operates through a network of National Training Centers (NTCs) and Associate Training Centers (ATCs) across the country. More than 10,000 technicians have been trained from industry, academic, and governmental organizations. The U.S. Postal Service, the U.S. Air Force, U.S. DOE Clean Cities Programs, and private fleets are example users of training materials from the NAFTC. The NAFTC is headquartered at WVU and conducts business under the auspices of the National Research Center for Coal and Energy. The NAFTC headquarters and the National Alternative Fuels Training Laboratory are located in Morgantown, West Virginia. To foster its mission, the NAFTC seeks the involvement of educational institutions; fuel providers; equipment and parts manufacturers; industry partners; federal and state agencies; and professional, educational, and training associations. The basic NAFTC Train-the-Trainers courses include classroom time to learn fundamentals, videos, discussions, pre- and post-tests, and lab/shop activities. When in Morgantown, West Virginia, a multi-bay automotive lab is used during training for demonstration, skills training, diagnostics, emissions testing and maintenance issues. A Repair Grade (RG) Dynamometer is used to demonstrate important automotive concepts as they relate to alternative fuels. New modules are developed to address specific topics in the evolution of the AFV industry. The NAFTC programs tap the capability of its member NTCs and colleges and departments at WVU, including the expertise of WVU’s College of Human Resources and Education, College of Engineering and Mineral Resources, the land-grant university Extension Service, and the National Research Center for Coal and Energy.